We are reckoned firm, actively involved in providing the first-class series of U Cup Ring. These products are available at nominal prices. Our organization is offering a wide variety of Seals for Hydraulics and Pneumatics that is available in standard as well as in customized sizes. 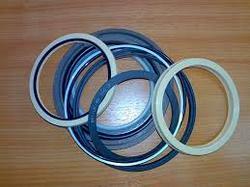 These seals are sourced from reliable vendors and are used in various equipment like excavators, dumpers and dozers. We offer a complete range of U-cups, specifically constructed from different materials such as homogeneous rubbers, leather and fabric reinforced rubber compounds. However, if in any application which requires a special U-cup, we can make available customized product according to the requirements or specifications of the clients.